Derrick Johnson is recovering from a sprained left knee. Derrick Johnson is confident he can play in the NFL. He’s hoping he can get healthy enough to prove it. Johnson, the former University of Maine receiver, was released by the New England Patriots earlier this week after missing a week of practices because of a sprained left knee. He signed May 19 with New England and was progressing nicely through the organized team activities before suffering the injury. Johnson said he was told by the Patriots that once he was healthy he would be re-signed. The team often does that to keep a full roster of healthy players while injured players recover. He’s hoping to be ready for the team’s three-day mini-camp that starts Tuesday. If not, he at least hopes to be ready when training camp opens in July. 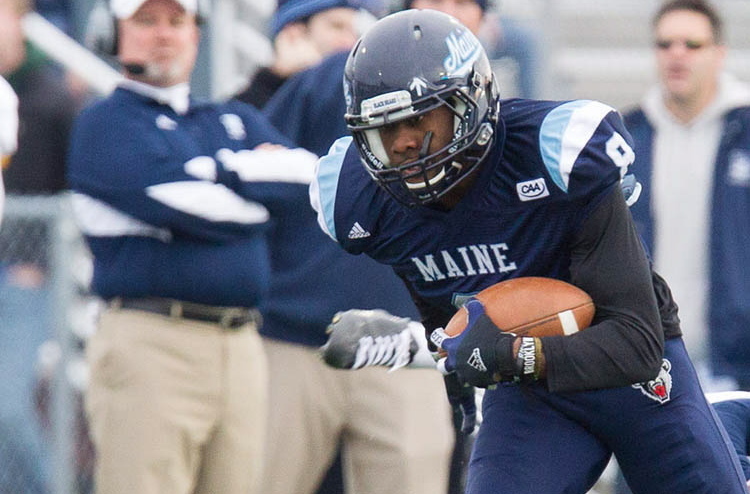 Johnson, a 5-foot-11, 190-pounder, led Maine in catches last year with 60 for 608 yards and two touchdowns. He finished his Maine career with 116 catches for 1,165 yards and four touchdowns. But he has had trouble staying healthy. He missed most of his sophomore year with a torn meniscus in his right knee, then was limited in how much he could practice in his junior year. He was healthy last year and had his best season. Maine Coach Jack Cosgrove said Johnson has the skill to play in the NFL but injuries have hampered him. His injuries at Maine, however, taught Johnson some important lessons. When healthy, Johnson possesses the kind of speed that can stretch a defense or break a long play. He was working both outside and in the slot, and catching passes from Tom Brady early in the camp. Johnson said he struggled at first to understand the Patriots’ offensive playbook, considered among the most complex in the NFL by players coming into the organization. But veteran Danny Amendola worked with him on reading defensive coverages and he eventually began to grasp the concepts. Cosgrove said the Black Bears’ playbook isn’t exactly like New England’s but the concepts – allowing the quarterback and receivers to read defenses at the line of scrimmage – are the same. The Patriots have four veteran wide receivers – Julian Edelman, Amendola, Brandon LaFell and Matthew Slater (who is primarily a special teams player) – with three second-year receivers and several rookies in camp. Johnson signed with the Patriots because he felt they gave him the best chance to make an NFL roster. New England historically stocks its roster with undrafted free agents like Johnson. He felt Maine provided him an excellent foundation to make an NFL team. There are six other former Black Bears on NFL rosters, including rookies Justin Perillo (tight end in Green Bay) and Kendall James (cornerback in Minnesota). “I think we do a lot of things fundamentally right in our program that we’re proud of,” said Cosgrove. “Someone just sent me a photo of Perillo in Green Bay, catching a pass from (Aaron) Rodgers. You can see the focus in his eyes on the ball. All the right things are in place. If those guys heard us say it once, we said it 100 times: You catch the ball with your eyes. And while Johnson’s time with the Patriots was brief – so far – he learned what’s expected of him. “You have to take advantage of every opportunity, go about as a professional and try to get better, to improve every day,” he said.